Weekly Recap #251: Some Other Things! Hello guys!! This weekly recap will be a little different, to say the least! I (Vilya) had to go home to my hometown for a funeral last week, so I haven’t prepared anything to show on the blog. But rest easy, things have kept moving on in the Pixel Ferrets office anyway! While Fred continues to prepare a ton of cutscene animations for the third zone, Teddy has set his sight on fixing and adding a bunch of things we’ve wanted to include in the game for quite a long time! 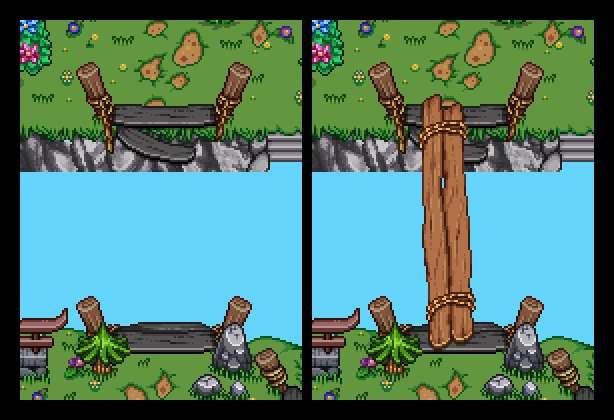 Another thing you might notice in the above GIF is – yes – Health bars above the enemies! Wohoo! I’m personally very happy about this update, as it makes hitting enemies much more satisfying when you can see their hp dwindle. True, you could do so before by checking the lower right corner, but it’s just not as effective (at least, I kept taking damage while doing that) or as satisfying. 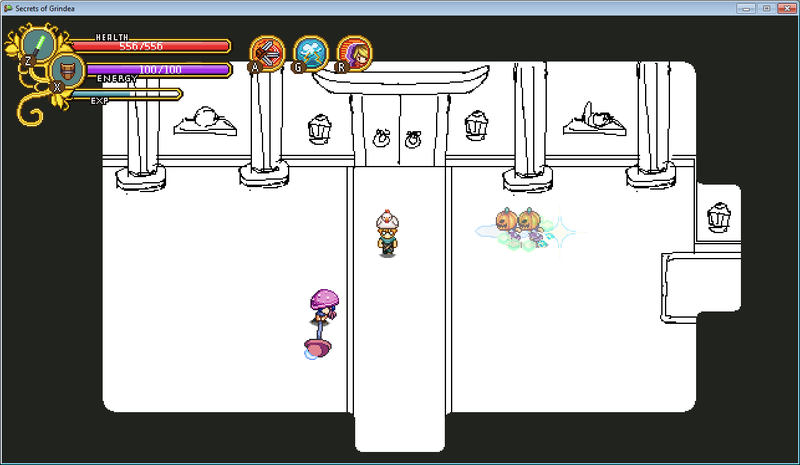 The health bar will appear once you hit an enemy and disappears after a while after you quit dealing damage to it. And YES, this means health bars in Multiplayer will be a thing! 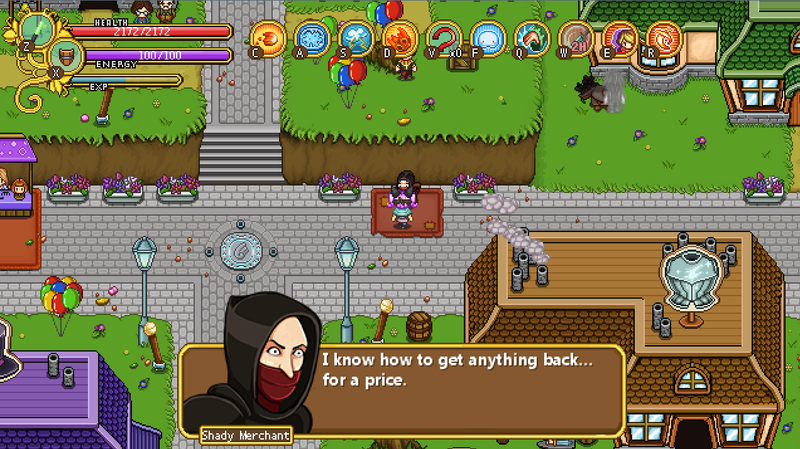 You’ll be able to see the health bar of your friends when they go under a certain amount of HP, so now you’ll know who really deserved that health orb, and who was the petty thief! 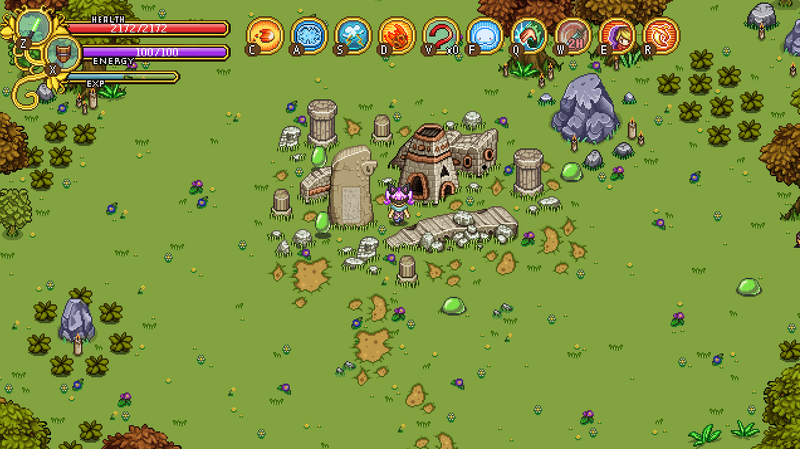 This is still an early work in progress, but the idea is that whenever a quest gets updated in some way, you’ll get a notice saying ‘Update’ above your head, after which the corresponding quest window will flash in the upper right corner. If you’re currently tracking another quest, it’ll fade back to that one after some time, and if you don’t track any quest at all it’ll simply fade away. This is all to make it a bit easier knowing when you’ve done something that change the objectives of a quest, or if you’re tracking another quest and ‘accidentally’ make progress in another, so you know what’s going on. 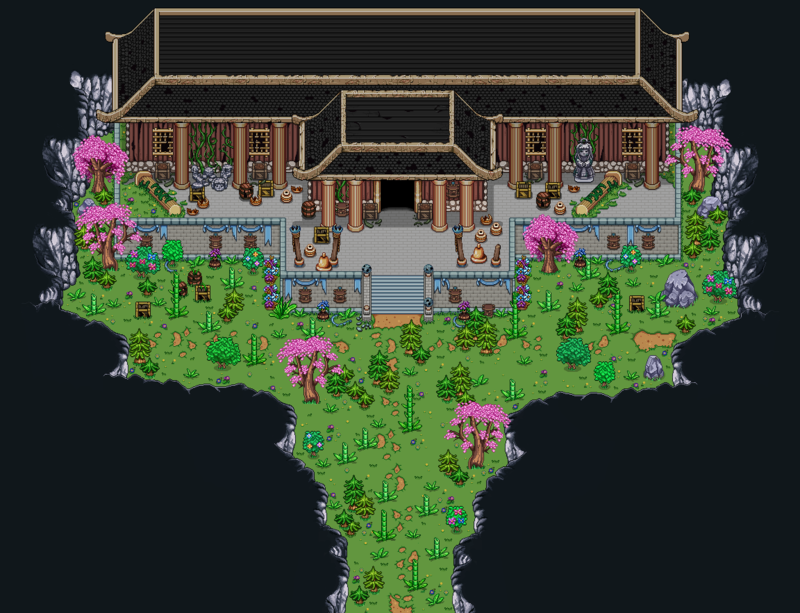 We also plan on doing a ton of improvements on the in-game map before Fred is fully done with all the animations needed to implement the scenes in Tai Ming’s third zone! There will be a ton of helpful trackers there, showing you exactly how much you’ve got left to do before achieving 100% on each area. But that’s for another post! Time to move into the sacred shrine! What could be hidden in here? 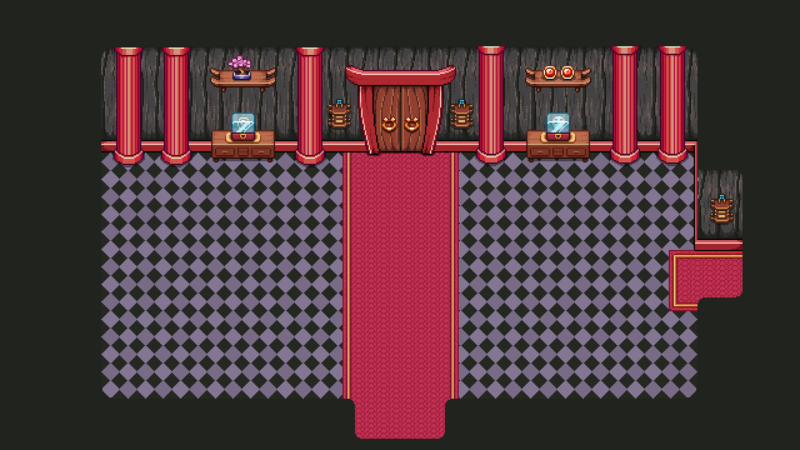 The first room is planned to be a room where you’ll do some fighting and… well, not much else really! 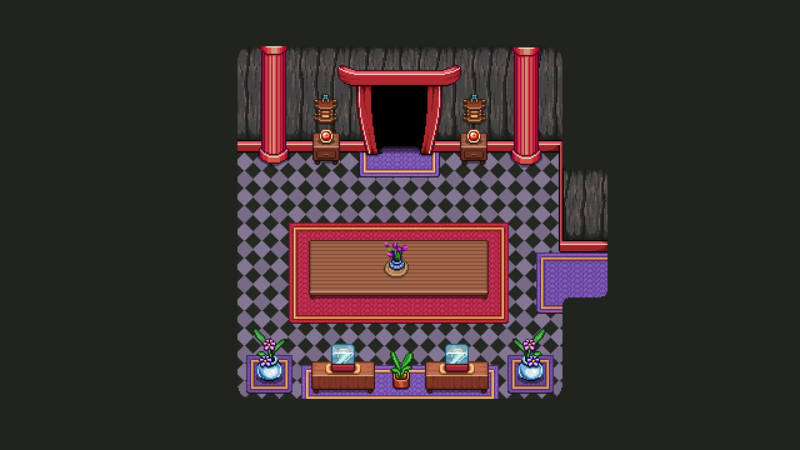 Now, we haven’t even planned on adding a flashback orb to this place, which means that technically, this room will only be viewed in the present (there will be no time rifts in this third part of Tai Ming). Because of this, I could have chosen to jump into doing the old and ruined stuff from the beginning, and completely skipped this step of making a past version. However, because we’re known to change our minds a lot, and since it’s a lot easier to start from something whole and ruin it after, than to start with something broken and paint it whole, I decided to make this version anyway! Next up, making the ruined version, which might even show up in the game!! As usual, this is typically a matter of dulling down color and painting a bunch of cracks and holes in everything. For this room, I also added a bunch of thrash in the corner which may serve as a spawning point for monkeys when you fight (it looks much better if they appear from behind somewhere, rather than just fade into existence)! Since you’ll mainly be fighting in here, there’s not a lot of stuff on the floor (as usual). 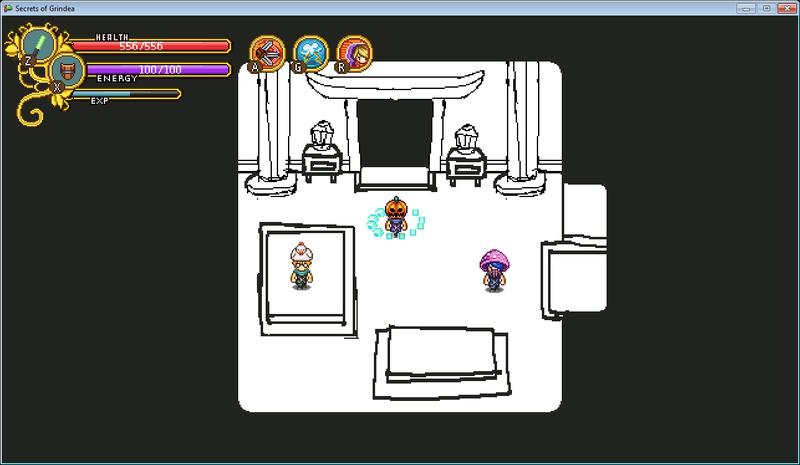 In the end the room will hopefully look lively enough one there’s a bunch of enemies roaming about! In this room, there will be a quite important flashback orb, showing you the priests trying to deal with certain horrible things that have happened in Tai Ming since your last time jump! They will be in meeting by this long table, discussing… Things ;) There’s also a scheduled guest appearance of an Arcade Mode character! Can you guess who? Now, we’ve also been making some slight changes and improvements that will be added to the second zone in a later update! And that’s because we haven’t ordered them yet! 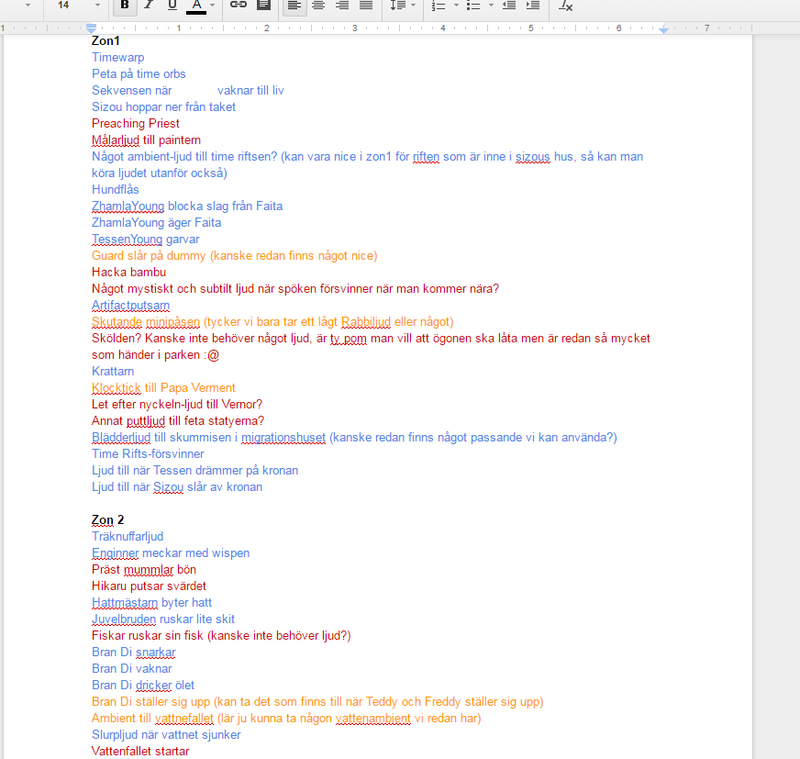 So, the other day we decided to make a big list of all the sound effects we could possibly want, by playing the areas and writing down any sound effects that seemed to be missing. Red means we felt a sound effect was unnecessary, Orange means we’ll use a previously made sound, and Blue means we’ll ask for a new sound effect. While we want to have a lot of sound effects in the game to make everything feel alive, sometimes it can get a little too much. Such as in the inn, where we at first had a ‘eating noodles’-sound, a ‘drinking’-sound, some ambience, and a ‘sighing’-sound (for Faita). 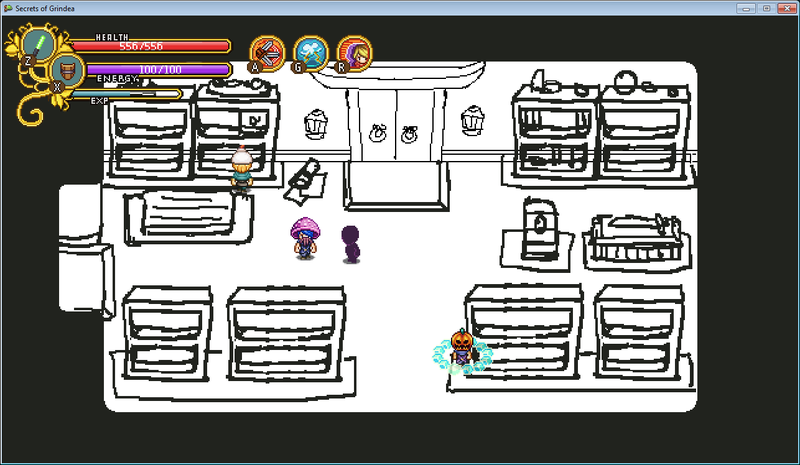 Playing all of those would likely make the inn a bit too noisy, so we decided against requesting all of them. But let’s not stop there! As the years go by, even this sacred shrine is forgotten and doomed to fall into disrepair. Working on this was pretty much a case of “how much of this can I ruin?” and then setting to work. 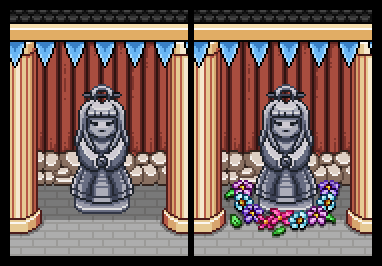 The lanterns are broken or have fallen down, some of the pillars have fallen, there’s some vines growing, the bells have fallen, statues have broken, cloth have ripped, and sometime in the past people began to move a lot of storage stuff outside of the shrine, leaving broken crates, jars and barrel there now. Feel free to share ideas on how to add further destruction to this map (so long as the building itself remains intact)! Hello guys, Vilya here! The first week since the second part of Tai Ming was uploaded to Frontline has now gone past, and we’ve spent eagerly listening to your feedback (and fixing bugs)! Thank you to everyone who left comments and suggestions, we’ll add and improve a bunch of things before we consider this part properly done. Some of you have already noticed that after finishing the first zone, it’s possible to get stuck, with the time warp portals disappearing. While this isn’t quite working as intended, the truth is that once you’ve finished an area, you’ll only be able to return to it in the present time. We have a couple of reasons for this, and it wasn’t an easy choice to make. I mean, of course it would have been great if you could always go back to finish any puzzles or secrets you might have missed. On the other hand, we felt like the area would have a bigger impact once you realize that when you’ve seen all there is to the story here, you can’t go back to talk to the people again. They have passed on already and belong only in a distant past which you shouldn’t have had access to in the first place. We also didn’t want the player to feel frustrated because they can’t go back to, say, the first zone, and simply try to convince Zhamla or Sizou to change their ways once you realize how events in that zone turned Zhamla from a young, optimistic boy into a serious and rather obsessed young man. We could have just simply not mentioned the fact, or thrown in a line about not changing past events, but again, this way felt like it’d have more of an impact. Now, obviously you’re not supposed to get stuck anywhere in the present. So how are we gonna solve the fact that there are a ton of blockades that you need time travel to get past? This fellow is a traveling adventurer (with dreams of becoming a Collector, perhaps?) who you’ll meet many times on your journey. Once you’ve finished the first part of Tai Ming, he’ll arrive to move things out of the way and create a passage that you can use as well. Once you’re done with the second zone, he’ll move on and do the same there. So what about all the treasures you might have missed on your first play through? 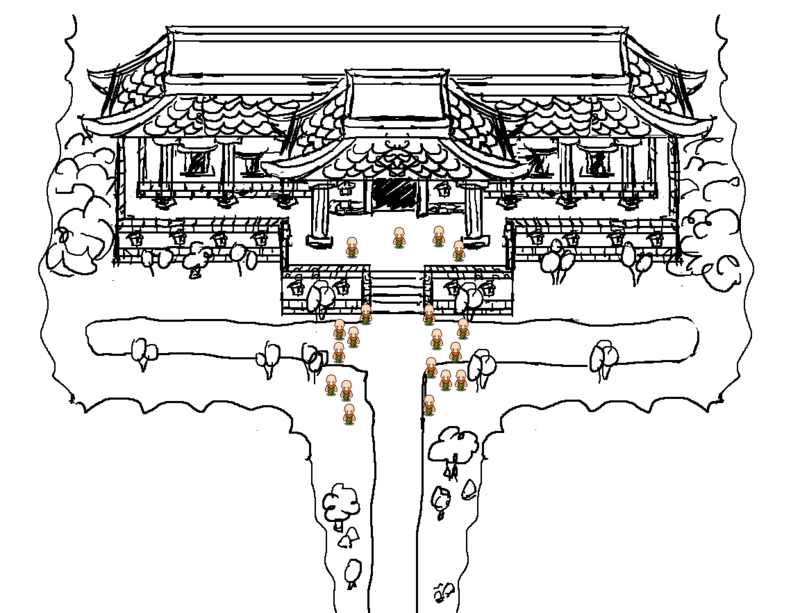 Worry not, you’ll be able to get them later in the game, one way or another (we have a bunch of ideas), so missing an item in Tai Ming won’t affect your 100% completion if you manage to find it somewhere else later. After all, hundreds of years have passed since the time when Tai Ming was a bustling town, and it’s not unlikely that once you stop messing around with the time jumps, someone simply moved the items somewhere else. 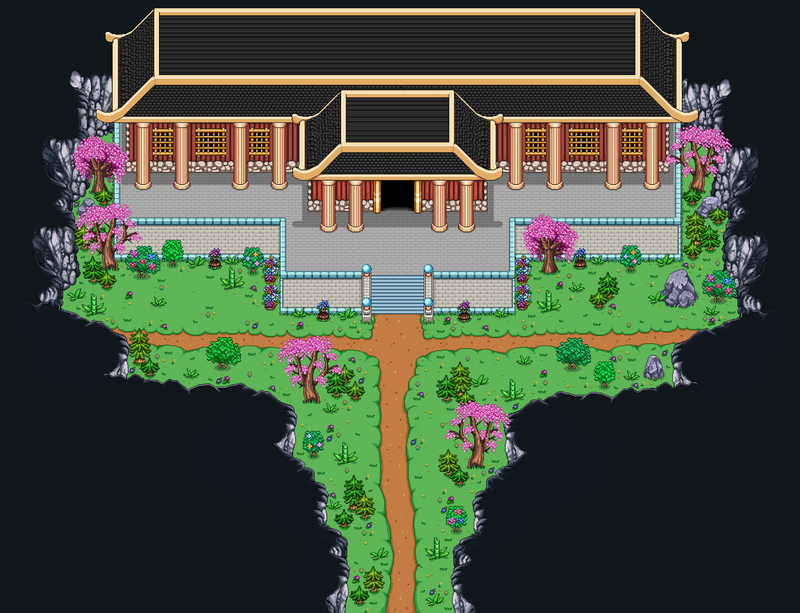 With this new information, it might be worth going through Tai Ming one more time to see if you missed any secrets, would you say? Head out and collect! The 100% completion awaits you! 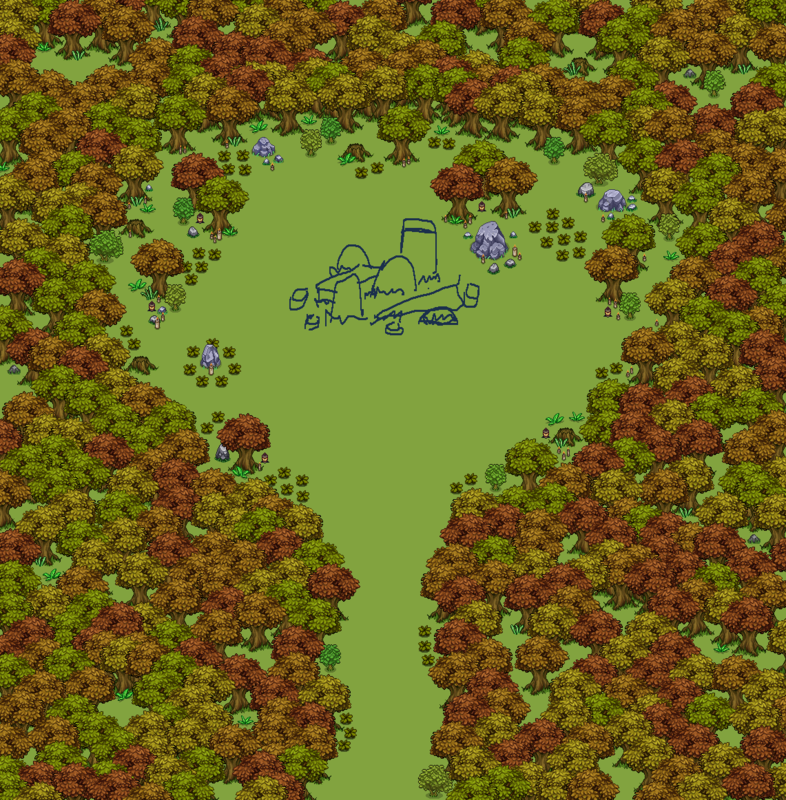 Next up, in celebration of having completed my part of Tai Ming’s second zone, I decided to take a quick break from the asian theme and move back to Evergrind City and its surrounding fields! This map here is in fact the one that can be found north of the farm, in the western Evergrind Fields! It’ll be the key to opening the final dungeon, but until you figure out how to do that it’s just a bunch of resting ruins in the middle of the woods. While this map likely won’t be implemented until all three zones of Tai Ming are completed, it’s been on my mind for a long time, and I’m sure the “this way is blocked until we implement temple x” notice has bothered a lot of you guys as well! This way, at least you’ll be able to move around almost everywhere (with the exception of the desert and onwards, which hasn’t been added yet of course) without annoying notices! And now, time to start working on Zone03. 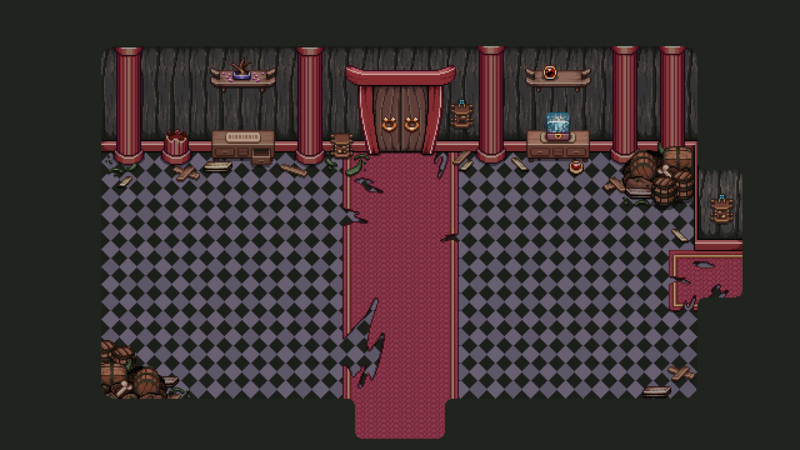 We’ve already begun prototyping most of the area, with the exception of the final two rooms (one which will house the Mimic boss, and one which will feature… something else). 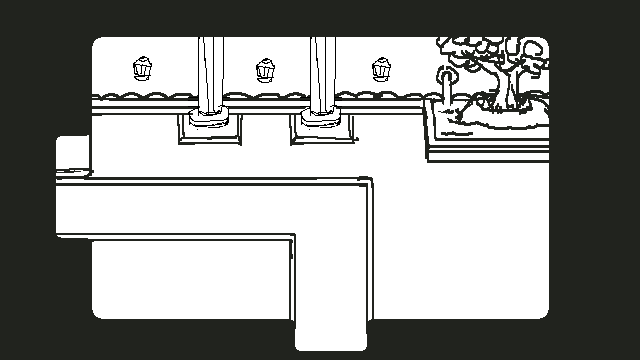 Our very first prototype consists of extremely simple black & white sketches, where I just draw whatever I think would look cool. I mainly freestyle the size of each map, but try to keep in mind certain things like whether there will be battles taking place, or where the camera will pause in cutscenes and such. Once I’ve sketched whatever I feel is important to size-check or run by the others, I give the sketches to Teddy who adds them to the game engine. He won’t add any colliders or anything at this point, but often he’ll make sure the doors work in cases like this where we need to run through more than one map connected to one another. Then, me, Teddy and Fred run through the maps in multiplayer, talking about what we think as we go along. Are the rooms big enough? Will there be enough room to fight? Does the camera position well? Often I’ve come up with ideas for what should happen in the rooms, either before or while I make the sketches, and in this multiplayer test we tend to brainstorm a lot as well. We’ll ask ourselves things like “wouldn’t it be cool if this happened here”, or “wouldn’t it be nice to have a painting of x there”, among other things. 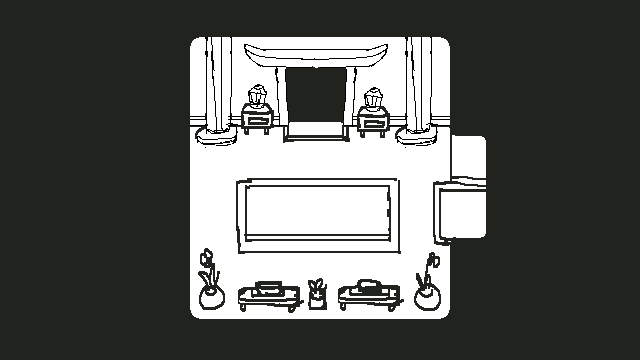 After going through each of the rooms in a similar way, with us talking about the sketches and me editing them as per what we decide, we’ve got a decent “whitebox” version of the place. There are no final graphics, but since we’re satisfied with the size, it’s possible to start adding colliders as well as prototyping enemy encounters.